1 John, iii. 3.--"And every man that hath this hope in him purifieth himself, even as he is pure." THIS hope, as the apostle is speaking, is a hope to be with Christ; and as Christ is, in highest verity, the manifestation of God who is infinite purity, it is a hope to be concomitant with purity, the purity of Christ and of God; which again is but a hope of being entered into, and perfectly answerable to, the purity of God. And then it follows, yet again, that every man that hath this hope in him will be purifying himself here on earth, even according to the purity of Christ with whom he hopes to be. I. If we can form a fit conception of what purity is. Ii we refer to examples, it is the character of angels and of God--the simplicity, the unstained excellence, the undimmed radiance, the spotless beauty. Or it is God as represented here on earth, in the sinless and perfect life of Christ; his superiority to sense and passion and the opinions of the world, his simple devotion to truth, his unambitious goodness, his holy, harmless, undefiled life, as being with, yet separate from sinners. If we go to analogy, purity is, in character, what transparency is in the crystal. It is water flowing, unmixed and clear, from the mountain spring. Or it is the white of snow. Or it is the clear open heaven, through which the sparkling stars appear, hidden by no mist of obstruction. Or it is the pure light itself in which they shine. A pure character is that, in mind and feeling and spirit of life, which all these clear, untarnished symbols of nature, image, in their lower and merely sensible sphere, to our outward eye. Or if we describe purity by reference to contrasts, then it is a character opposite to all sin, and so to most of what we see in the corrupted character of mankind. It is innocent, just as man is not. It is incorrupt as opposed to passion, self-seeking, foul imaginations, base desires, enslaved affections, a bad conscience and turbid currents of thought. it is the innocence of infancy without the stain--that innocence matured into the spotless, positive and eternally established holiness of a responsible manhood. It is man lifted up out of the mires of sin, washed as a spirit into the clean white love and righteousness of his redeemer, and so purged of himself as to be man, without any thing of the sordid and defiled character of a sinner. Or we may set forth the idea of purity, under a reference to the modes of causes. In the natural world, as for example in the heavens, causes act in a manner that is unconfused and regular. All things proceed according to their law. Hence the purity of the firmament. In the world of causes, it is the scientific ideal of purity that events transpire normally, according to the constitutive order and original law of the creation. But as soon as a soul transgresses, it breaks out of order, and its whole internal working becomes mixed, confused, tumultuous, corrupt. Abiding in God, all its internal motions would proceed in the simple, harmonious, orderly progress of the firmament, and it would be a pure soul. Plunging into sin, it breaks order and falls into mixtures of causes in all its actions. The passions are loose upon the reason, the will overturns the conscience, the desires become unruly, the thoughts are some of them suggested by the natural law of the mind, and some are thrust in by the disorders of vitiated feeling, corrupt imagination, disordered memory, and morbid impulse. In short, the soul is in a mixture of causes, and so out of all purity. The man is corrupted, as we say, and the word corrupt means broken together, dissolved into mixture and confusion--which is the opposite of purity. Or finally, we may describe purity absolutely as it is when viewed in its own positive quality. And here it is chastity of soul, that state of the spiritual nature in which it is seen to have no contacts, or affinities, but such as fall within the circle of unforbidden joy and uncorrupted pleasure. It is unsensual, superior to the dominion of passion, living in the pleasures of the mind and of goodness, devoted in its virgin love, to the converse of truth only, and inaccessible to evil. Absolute purity is untemptible, as in God. Adam therefore was never in absolute purity. His purity was more negative than positive. He was innocent, he had not sinned; but for want of an established positive purity, he was ready to be tempted and open to temptation. But if he is now among the glorified, he is in absolute purity because he is untemptible. Real chastity is that which can not know temptation, and this is what we mean by absolute purity. It puts the soul as truly asunder and apart from the reach of evil suggestion as God himself is, in the glorious chastity of his holiness. II. To show, to raise us up into the state of complete purity before God. The call of the word is,--Come now and let us reason together, saith the Lord, though your sins be as scarlet they shall be as white as snow; though they be red like crimson they shall be as wool. And it is curious, to observe, when we read the scripture, what an apparatus of cleansing God appears to have set in array for the purification of souls;--sprinklings, washings, baptisms of water and, what are more searching and more terribly energetic purifiers, baptisms of fire; fierce meltings also as of silver in the refiner's crucible; purifyings of the flesh and purgings of the conscience; lustrations of blood, even of Christ's own blood; washings of the word, and washings of regeneration by the Holy Ghost. It would seem, on looking at the manifold array of cleansing elements, applications, gifts and sacraments, as if God had undertaken it as the great object and crowning mercy of his reign, to effect a solemn purgation of the world. We seem, as we read, to see him summoning up all angels and ministers of his will and instruments of his power, and sending them out in commission to cleanse the sin of the world, or even to wash the defiled planet itself into purity. Or, if we observe more directly what is said concerning the particular object of Christ's mission as a work of redemption, it is plainly declared that he gave himself for the church,--That he might sanctify and cleanse it with the washing of water by the word, that he might present it unto himself a glorious church, not having spot or wrinkle or any such thing, but that it should be holy and without blemish. And then again the disciple himself who has embraced the Lord, in that which is the chief mercy and last end of his mission, will purify himself, it is declared, even as Christ is pure; that is, if I rightly understand the language of the text, he will be engaged to purify himself, endeavoring after purity, such as Christ himself reveals. It is not intended, I suppose, to affirm that every disciple, in the Christian hope, has actually become as pure as Christ, but only that this is his end or mark. But a question rises here of great practical significance, viz., whether, by a due improvement of the means offered in Christ, or by any possible faith in him, it is given us to attain to a state which can fitly be called purity, or which is to itself a state consciously pure? To this, I answer both yes and no. There may be a Christian purity that is related to the soul as investiture, or as a condition superinduced, which is not of it, or in it, as pertaining to its own quality, or to the cast of its own habit. Christ, in other words, may be so completely put on that, the whole consciousness may be of him, and all the motions of sins give way to the dominating efficacy of his harmonious and perfect mind; when, at the same time, the subject viewed in himself, or in the contents and modes of causes in his own personality, is disordered, broken, mixed, chaotic, and widely distant still from real purity. The point may be illustrated by a supposition. Let a man habitually narrow and mean in his dispositions, fall into the society of a great and powerful nature in some one distinguished for the magnanimity of his impulses. Let this nobler being be accepted as his friend, trusted in, loved, admired, so as to virtually infold and subordinate the mean person, as long as he is with him, to his own spirit. This, at least we can imagine, whether any such example ever occurred or not. Now it will be seen that, as long as this nobler nature is side by side with the other, it becomes a kind of investiture, clothes it, as it were, with its own impulses and even puts it in the sense of magnanimity. Consciously now the mean man is all magnanimous; for his mean thoughts are, by the supposition, drunk up and lost in the abysses of the nobler nature he clings to. He is magnanimous by investiture; that is, by the occupancy of another, who clothes him with his own characters. But if you ask what he is in his own personal habit, cast, or quality, he is little different, possibly, from what he was before. He has had the consciousness waked up in him of a generous life and feeling, which is indeed a great boon to his meagre nature, and if he could be kept, for long years, in the mold of this superinduced character, he would be gradually assimilated to it. But if the better nature were to be soon withdrawn by a separation, he would fall back into the native meanness of his own proper person, and be what he was with only slight modifications. Now Christ, in his glorious and divine purity, is that better nature which has power, if we believe in him with a total all-subjecting faith, to invest us with a complete consciousness of purity, to bring every thought into captivity to his own incorruptible order and chastity. He is such a cause upon us, when so received, that all our mixed modes of causes, will be subjected to the interior chime of his own all perfect harmony. Our consciousness even is cast in the molds of his; for he is so effectually put on, that he dominates in the whole movement of our experience. This, at least, is conceivable as being the permitted or possible triumph of faith; while, at the same time, regarding what we are in ourselves and apart from this divine investiture, we are very far from any such purity. Still the case is varied here from that which we just now supposed, in the fact that the assimilation of the subject party will be more rapid and certain, because of the agency of the Spirit concurring with the power of Christ; and also in the fact that the union established by faith is more interior and more indissoluble. He may, therefore, have the Spirit to work in him and the power of Christ to rest upon him in such measure as to be kept in the conscious chastity of Christ's own love, year by year, and be wrought into a continually approaching assimilation to it. The answer thus given to the question raised agrees at all points, it will be seen, with the scripture, and particularly with what is taught by our apostle in close connection with my text. On one side of it he writes,--If we say that we have no sin, we deceive ourselves, and the truth is not in us; for, however deep we are in our union to Christ, or however completely we are invested in his purity, we are not in ourselves restored, in the same degree, to the character of it. We are in a kind of anticipative purity, which is becoming personal to us and a fixed habit; we are living to be pure, as Christ is; but, regarded as apart from him, the work is only initiated,--we still have sin, we are broken, disordered, and corrupt. For, as long as we abide in Christ, our action is from him, not from our own corrupt and broken nature; exactly as the apostle writes, on the other side of the text, or immediately after:--Whosoever abideth in him sinneth not. He lives in a consciousness, that is, which is not sustained by his own mere humanly personal character, but by the sense of another, and the righteousness that is of God by faith upon him. The result, consequently, is that, being thus held up by the attachment to him of Christ's affinities, he is growing like him,--pure as he is pure. The diseased qualities gendered in him, heretofore, are being gradually purged away. His passions are being tamed to order and refined to God's pure dominion. His imaginations settle into the truth, and grow healthy and clear. The fashion of this world is not only broken, as it was in the first moment of God's discovery to his heart, but the memories of it fade, the diseased longings are healed, so that all his old affinities, in this direction, will at last be extirpated. All the mixed causes involved in sin or spiritual impurity will fall into chime, and all the foul currents of evil suggestion be cleared to a transparent flow. The mind will grow regular and simple in its action, ceasing to be vexed, as it was, by noxious mixtures of fear, selfishness, doubt, and temptation. And so all the inbred corruptions of its bad state--that is, those which remain over as effects of sin, after sin as a voluntary life is forsaken--will be gradually purged away. To illustrate how far it is possible for this purifying work to go on in the present life, I will simply say that the very currents of thought, as it is propagated in the mind, may become so purified that, when the will does not interfere, and the mind is allowed, for an hour, to run in its own way, without hindrance, one thing suggesting another as in revery, there may yet be no evil, wicked, or foul suggestion thrust into it. Or in the state of sleep, where the will never interferes, but the thoughts rush on by a law of their own, the mixed causes of corruption may be so fax cleared away, and the soul restored to such simplicity and pureness, that the dreams will be only dreams of love and beauty: peaceful, and clear, and happy; somewhat as we may imagine the waking thoughts of angels to be. There have been Christians, who have testified to this heavenly sereneness of thought, out of their own experience. And precisely this is what Paul refers to, when he speaks of bringing into captivity every thought to the obedience of Christ. When the mixed causes are taken captive in the soul, and Christ is the law of the whole action, then, in the same degree, simplicity returns and purity. Still the body is dead because of sin. Disease, corruption, so far, at least, remain, and therefore it doth not yet appear what we shall be. Perfect, absolute purity it is hardly supposable may be realized here. Enough to know that there need be no limit to the process, while life remains, and that, when life ends, it may be gloriously approximated to the state of completeness. Or perhaps some one of my audience may just here raise a doubt from the other side,--whether absolute purity can ever be restored. Can the soul's chastity, once lost, ever be recovered? Having once sinned, can it ever become pure in the absolute and perfect sense, as if it had not? Let no such doubt be harbored. We must not be too much under the power of social impressions. If society pronounces on the irredeemable loss of fallen chastity, society has no mercy; and pride, as well as truth, enters into its relentless judgments. Be this as it may, God has undertaken to redeem the fall of sin, and restore the soul to purity as a condition of absolute holiness. Browned by sin, mottled by the stains of a corrupted life, he has under taken still to give it the whiteness of snow. True he can not undo what has been done. The sin is committed, the corruption has followed. Therefore, if there were any prudishness in angelic minds, they might well enough refuse forever to own us as beings intact by sin. And yet God can raise us to a purity that is higher even than the purity of an intact virtue. He can make us untemptibly pure, pure even as Christ is pure, which Adam certainly was not. What we call purity in him, prior to his sin, is beautiful and lovely; a pure white lily blooming in the creation's morning; but it is frail also and temptible, and, before the noon is up, it hangs upon a broken stem, dishonored and torn. God can raise us up, if not to the same, yet to a much higher, and stronger, and more absolute chastity, the participation, viz., of his own unchangeable holiness! III. To inquire in what manner we may promote our advancement toward the state of purity, and finally have it in complete realization. And, first of all, we must set our heart upon it. We must learn to conceive the beauty, and glory, and the essential beatitude of a pure state. We must see the degradation, realize the bitterness, confusion, disorder, instability, and conflict of a mixed state, where all the causes of internal action are thrown out of God's original law. We must learn to conceive, on the other hand, and what can be more difficult--the dignity, the beauty, the infinitely peaceful and truly divine elevation of a pure soul. Nothing is more distant from us, in our unreflective, headlong state of carnality and self-devotion, than to conceive purity. It is high like God, and we can not attain unto it. And therefore our desire after it can not be duly inflamed, or kindled;--as it must be, if we are ever to obtain it. Labor then, with all closest, most persistent application, to conceive purity;--what it would be to you, if your soul were in it; the consciousness of it; the essential peace; the elevation above all passion and unregulated impulse; the singleness and simplicity of it; the glowing shapes and glorified visions of a pure imagination; the oneness of your soul with God; the conscious participation of what is highest in God, his untemptible chastity in goodness and truth. Work at this idea of purity, turn it round and round in your contemplations, reach after it, pray yourself into it, and have it thus as the highest conceivable good, the real good you seek,--to be pure. Let it be your life to envy God's purity, if I may so speak; for, if there be any holy, and blessed, and fruitful kind of envy, it is this. Have it as the accepted aim and effort of your life, to be assimilated thus in purity to God; for when such a desire becomes practically fixed in you, the way will certainly be found. The way to purity is difficult of discovery only to those who practically do not care to find it. One of your early discoveries will be, that the way to attain to purity of soul is, not to forsake the world and retire from it. This was the error that originally carried men and women into remote deserts and caves, and finally built up monasteries and instituted vows of single life, or celibacy. It was to get away from the world, and have nothing to think of but God, and so to present the soul as a chaste virgin to Christ. It was called the state of spiritual chastity, and the souls thus taken out of the world were supposed to be specially pure and incorrupt, or in a certain way to be. It was as if the church had prayed, directly against Christ's word, to be taken out of the world. And then, what a horrible imposture did this unchristian gospel of purity prove itself, ere long, to be! No, the only real and truly christian way of purity is to live in the open world and not be of it, and keep the soul unspotted from it. There are no fires that will melt out our drossy and corrupt particles like God's refining fires of duty and trial, living, as he sends us to live, in the open field of the world's sins and sorrows, its plausibilities and lies, its persecutions, animosities, and fears, its eager delights and bitter wants. St. Francis de Sales had been able, in his knowledge of the cloistered men and the cloistered life, to see how necessary it is for the soul to be aired in the outward exposures of the world, and, if we do net stop to question the facts of his illustrations, no one has spoken of this necessity with greater force and beauty of conception. "Many persons believe," he says, "that, as no beast dares taste the seed of the herb Palma Christi, so no man ought to aspire to the palm of Christian piety, as long as he lives in the bustle of temporal affairs. Now, to such I shall prove that, as the mother-pearl fish lives in the sea without receiving a drop of salt water; and as, toward the Chelidonian islands, springs of fresh water may be found in the midst of the sea; and as the fire-fly passes through the flames, without burning its wings; so a vigorous and resolute soul may live in the world, without being infected with any of its humors, may discover sweet springs of piety amidst its salt waters, and fly among the flames of earthly concupiscence, without burning the wings of the holy desires of a devout life." It was only forbidden him to say, what is not forbidden me, that here alone, in these common exposures of work and contacts of duty, is true christian purity itself successfully cultivated. Alas! for the man who is obliged to be shut up to himself, as in the convent life, to face his own lusts, disorders, and passions, and strangle them in direct conflict, with nothing else to do or to occupy the soul. Having this determined, that he who will purify himself as Christ is pure must live in the world, then one thing more is needed, viz., that we live in Christ, and seek to be as closely and intimately one with him as possible. And this includes more things than the time will suffer me to name. 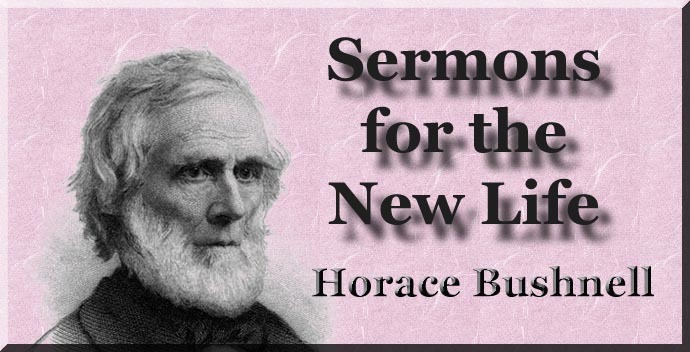 First, a willingness wholly to cease from the old man, as corrupt, in order that a completely new man from Christ may be formed in you; for, if you will halve the sacrifice and retain what portion is safe or convenient of the old life of nature, it is no such thing as purity that you propose, nothing but a baptizing of mixture and defilement. I call it a new man that you want, after the scripture method, because the character is the man more truly than any thing else, and there is no purity but to be completely new. Therefore the old must as completely die,--which it will not, if we secretly nourish and cling to it. Secondly, the life must be determined implicitly by the faith of Christ. Purifying their hearts by faith, says an apostle; well-understanding that faith in Christ as the true sacrifice and grace, is the only power that can purge the conscience from dead works to serve the living God in purity. It is faith only that can truly appropriate Christ as a Saviour, able to save to the uttermost, and faithful to cleanse us from all unrighteousness. Then again, which is more, if possible, it is faith alone that enables one to embrace Christ as a power, and live in the society of his person; for it is thus, pre-eminently, that a soul may become purified. It is Christ beheld, with face unveiled, reflecting God's own beauty and love upon us, as in a glass, that changes us from glory to glory. If by faith we go with Christ; if we bear his cross in duty after him; if we hang upon his words, wrestle with him in his agony, die with him in his passion, rise with him in his resurrection; in a word, if we are perfectly insphered in his society, so as to be of it, then we shall grow pure. The assimilating power of Christ, when faithfully adhered to as the soul's divine brother, and lived with and lived upon, will infallibly renovate, transform, and purify us. The result is just as certain as our oneness or society with him. We shall grow pure because he is. The glorious power of his character and life will so invest our nature, that we shall be in it and live it. It is only they that talk much of faith, meaning by it the faith of notions and opinions, and not the faith of Jesus as a personal revelation,--these only it is who can not be purified by their faith. Sometimes they even have it as their merit, judging from their confessions, that they are growing more and more corrupt. Having that faith to which Jesus is personally revealed, you can be conscious of a growing purity of soul, and I know not any other way. God forbid that you should think of making purity for yourself, or by any operation on yourself. It must flow into you from above. It must be the new man that is created in Christ Jesus,--created by your faith, as receiving of him and of his fullness, grace for grace. And O, the dignity, the conscious blessedness of a life of faith, when it knows in itself, or distinctly sees, the divine purity forming its own chaste image of love and truth within;--beholds the fine linen, clean and white, which is the righteousness of the saints investing the soul, as a robe of life from God! In such a life there is consciously something going on, which answers to the great errand of life and gives it the seal of blessing. Again, passing over many other particulars, I will simply draw your minds a little closer to the text by observing, as included in the general idea of living in Christ, a looking forward to him in his exalted state, and an habitual converse with him there. He that hath this hope in him, says the text;--understanding that the hope of being with Christ, and seeing him as he is, does of itself draw the soul toward his purity. I say not that we are to be looking away to heaven, as being disgusted with the world; much less to be praising heaven's adorable purity in high words of contrast, as if to excuse or atone for the lack of all purity here. I only say that we are to be much in the meditation of Christ as glorified, surrounded with the glorified; to let our mind be hallowed by its pure converse and the themes in which it dwells; to live in the anticipation of what is most pure in the universe, as being what we most love and long for in the universe; and so we are to be raised by our longings, and purified with Christ by the hopes we rest upon his person. This hope, this reaching upward of soul to Christ, is exactly what Paul means, when he speaks of living a life that is hid with Christ in God. When a soul is there infolded, hid with Christ in the recesses of God's pure majesty, O, what airs of health breathe upon it and through it! how vital does it become, and how rapidly do the mixed causes of sin settle into the transparent flow of order and peace! IV. Some of the signs by which our growth in purity may be known. This I will do in the briefest manner possible, and conclude. That we abide in the conscious light of God, while living in a world of defilement, and know him as a presence manifested in the soul. Blessed are the pure in heart, for they shall see God. Purity sees God. A good conscience signifies the same; for the conscience, like the eye, is troubled by any speck of defilement and wrong that falls into it. A growing sensibility to sin signifies the same; for, if the conscience grows peaceful and clear, it will also grow tender and delicate. If you are more able to be singular and think less of the opinions of men, not in a scornful way but in love, that again shows that the world's law is losing its power over you, and your devotion to God is growing more single and true. Do you find that passion is submitting itself to the gentle reign of God within you, losing its heat and fierceness, and becoming tamed under the sweet dominion of christian love? That again is the growth of purity. The discovery that your imagination ceases to revel in images of wrong, revenge, and lust, becoming at once more quiet and more clear, conceiving God and Christ and unseen worlds of purity, with greater distinctness and sublimity, and roving, as by a divine instinct, among the eternal verities and transcendent glories of a perfect state, asking there to be employed and nowhere else with so great zest,--this also shows that a high and sacred affinity for what is pure is growing stronger and more clear within you. So, again, if your feeling reaches after heaven, and your longings are thitherward, if you love and long for it because chiefly of its purity; loosened from this world not by your wearinesses and disgusts, which all men suffer, but by the positive affinities of your heart for what is best and purest above,--this also is a powerful token of growing purification. Do you also find that your thoughts, when freest and most unrestrained, are yet growing simple, orderly, right, and true, interrupted less and less frequently by bad or wicked suggestion?--then you have in this a most convincing and conclusive proof, that you are being delivered of the mixtures and defilements of a corrupted nature. Or, again, it is a yet more simple sign, and one that in eludes, in a manner, all others, if you find that you are deeper and deeper in the love of Christ. For, if Christ spreads himself over your being, and you begin to know nothing else and want nothing else; if you love him for his character, as the only perfect, and cleave to his sinless life, as the holiest, and loveliest, and grandest miracle of the earth; if words begin to faint when you speak of him, and all that can be said or thought looks cheap and low, compared with what he is; then it is most certain that you are growing in purity; for the growing enlargement of your apprehensions of Christ is the result of a growing purity, and will be also the cause of a purity more perfect still. And now, my brethren, I have many things to say, but I only ask whether you perceive, by signs like these, that you are growing pure? That you believe yourselves to be disciples we know,--that is easy; but I ask you here seriously, before God, whether you find that your religion has any purifying power? Is it a baptism? Is it a finer's fire? Does it move you to cry,--Create in me a clean heart, O, God? True piety, brethren, is a power, and purity is the result;--a result, as I have shown you, that may be indefinitely realized, even here on earth. Is it realized in you by the signs I have named? You hope in Christ that you shall be with him, and see him as he is. O, it is well, the most elevating hope, the most inspiring and celestial thought, which ever fell into the soul of a mortal! I only ask if you see in your life, in the practical bent of your works, that this hope has verity enough in you to take hold of your springs of action, and bring you into a true endeavor after Christ's purity? What an opinion then will you be seen to have of the soul when you are living for its purity! And then, what sublimity is there to your eye in that state of glory, in which your soul practically dwelleth among its kindred spirits, pure as they, and all as Christ is pure. These are they that have washed their robes and made them white in the blood of the Lamb. But how little signifies this discourse of purity to very many of my hearers! I well understand the vacant, dreamy sound of such discourses before the conception of purity, and the sense of it gotten out of the want and out of Christ the supply, is opened to the soul. What is there so great in purity? who, that is untouched by God's gracious quickening, cares enough for purity to give the word an earnest significance? It has, of course, no greatness to us, because the fact itself is a lost fact. We can not think it, because it is really gone out of the mind's reach and knowledge. But, O, when once the heart feels a touch of its divinity, then a yearning is wakened, then the greatest and sublimest thing for a mortal is the unmixed life! a soul established in the eternal chastity of truth and goodness! O, God! who of this people shall ever know what it is? I can not tell them; thou alone canst breathe into them, and set in their living apprehension a truth so impossible for any mere words to express! This only I can testify, as God has given me words, (and I pray God to show you their meaning,) that the heaven we are sent here to prepare, is a most pure world, open only to the pure;--And there shall, in nowise, enter into it any thing that defileth, neither whatsoever worketh abomination; or maketh a lie, but they that are written in the Lamb's book of life.